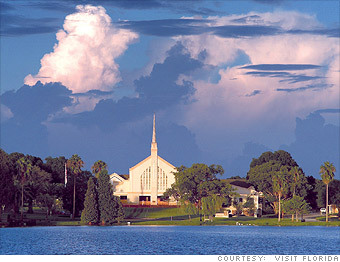 Located on an interstate highway between Tampa and Orlando, Lakeland's residents are used to people just passing through. But those who decide to stay don't find it very difficult to afford a place. While both home prices and incomes have been hit hard here over the past several years, the decline in home values has far surpassed falling wages, said Ken H. Johnson, professor of real estate at Florida International University. Home prices have fallen 58% since the housing bubble burst, to a median of $85,000. Taxes are also low. With today's low interest rates, a family who buys a house at the median price and puts 20% down would have a monthly payment of under $400, including taxes. Meanwhile, the jobs picture is improving. Long a pit stop for travelers, Lakeland has recently become a destination, thanks to the opening of the Legoland theme park in October. Legoland now employs 1,000 people. And a water park just opened this month, which should create even more jobs. That should help to further improve the unemployment rate, which fell to 9.5% in March, down from 11.3% the year before. Home prices in these 10 metro areas expected to climb anywhere between 10% and 21% by the end of next year, according to Fiserv.